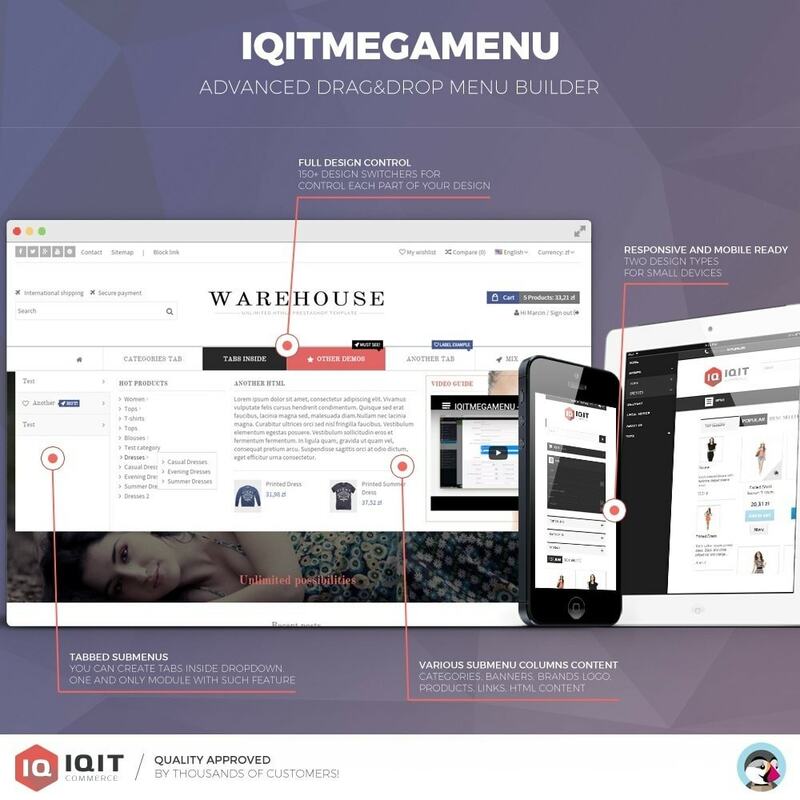 IQITMEGAMENU is highly customizable responsive menu module. With our module you can get both navigations inside only one package. You can also select where to show vertical menu (on the left column or as the expanded menu on horizontal bar). It is possible to make sticky horizontal menu (it will follow you when you scroll a page down). You can also choose from 400+ icons or add your owns. Moreover, you can set your own color per each tab, align it right or add extra tag label to make important items more visible! No more a single column menu display! 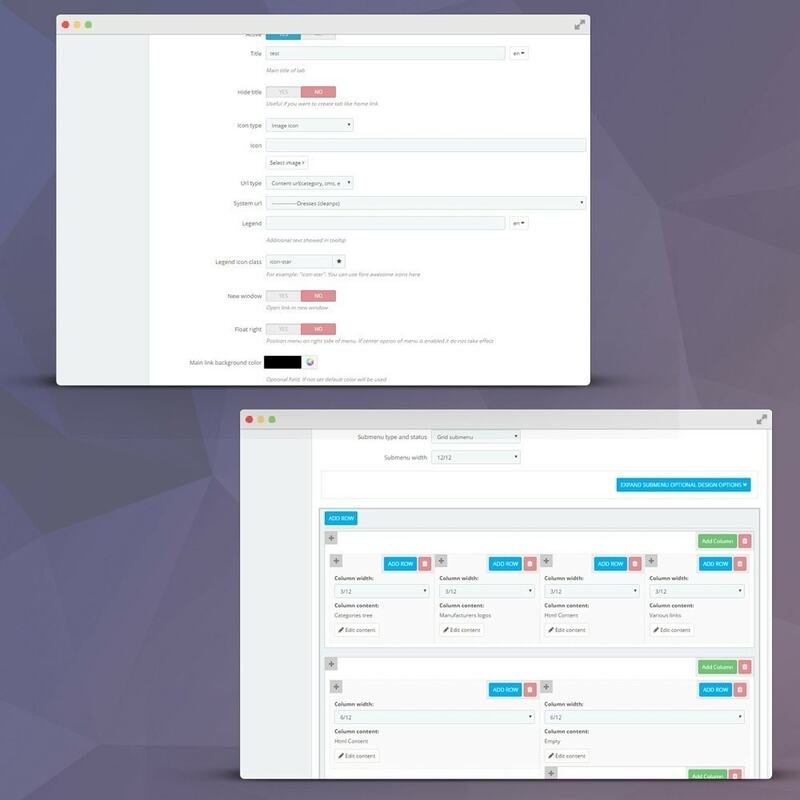 This menu ships with Drag&Drop intuitive bootstrap (responsive) grid system to cover all of your categories, sub-categories, manufacturers, image banners, custom html content or even selected products. 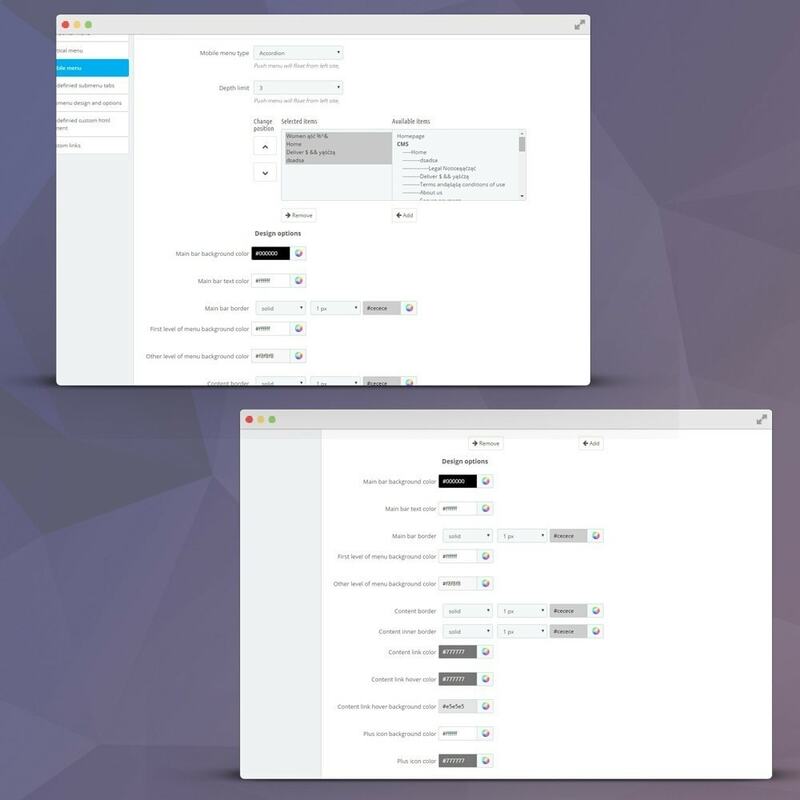 It includes also individual design controls for each menu item, which is the revolutionary way to creating unique and beautiful drop down menu. For every single column, you can set different designs and widths. Do you use custom theme? No problem! You can decide whether you want to load bootstrap and Font Awesome libraries with module or not. 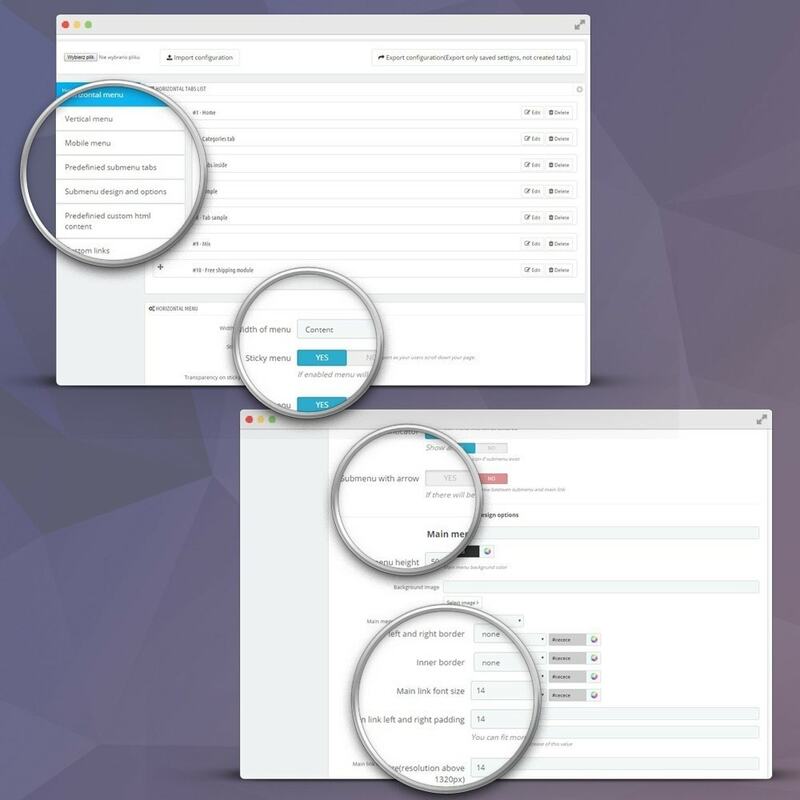 In the case of troubles connected with implementing navigation with your theme, you will get a free support for that! You can create unique design of your mega menu. There are settings for every part of design, there are more than 150 design switchers including typography, colors, backgrounds, borders, box shadows, styles and custom CSS … you can set this options as global for entire menu or unique per each tab. Also inside submenu you can set unique styles for each column, which you add. 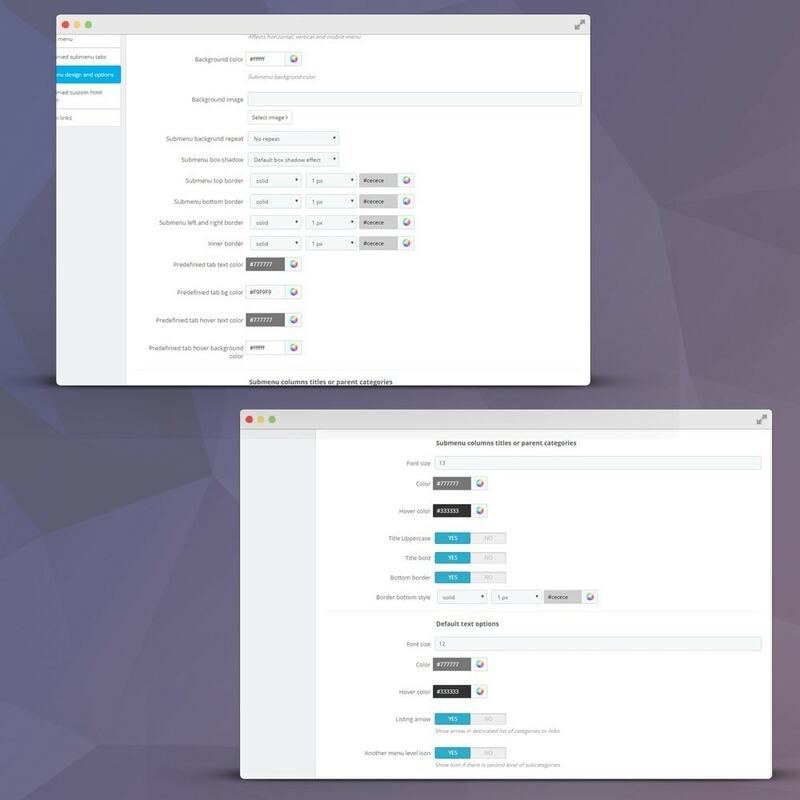 It is possible to import and export design configuration. Smooth CSS transitions include (fade, fade with slide, not effect). It is the only navigation on market which has such feature! 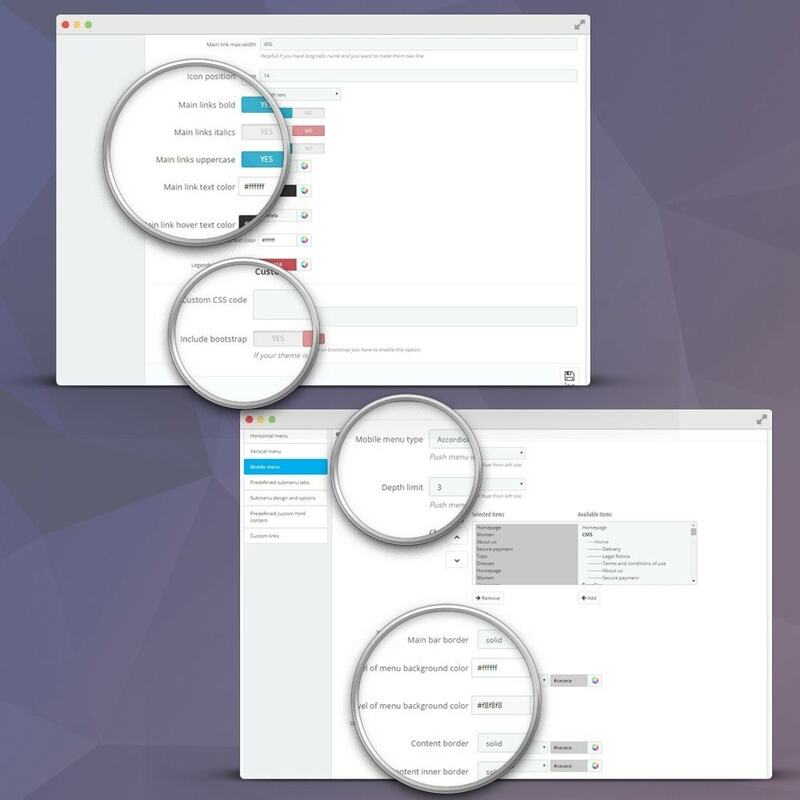 You can create tabs inside submenu in the same way as you create main items with Drag&Drop and powerful design settings. Two types of mobile menu include: push and accordion. They are separated from desktop menu, so you can create advanced category presentation for pc and laptops, and simple for mobiles. You will get support for all mobile devices and browsers (iOS, Android, Windows Phone). You can set different paddings and font sizes of tabs on desktop, which depends on resolution. A great add on to my store. Setting it up takes a bit of time to get it looking just right but its functionality is exceptional. Highly recommended. Really good module and great develloper ! Simple and intuitive to use. I was afraid about the implementation on my store but it's been installed without any problem !